Lewis Hamilton clawed back 25 points in his championship battle with Nico Rosberg after winning a chaotic British Grand Prix from sixth on the grid. Shock: Nico Rosberg's gearbox giving up on him at mid-distance,denying us the chance of a fascinating late duel with Lewis Hamilton. Shocker: Fernando Alonso's race started in rather bizarre circumstances, parking himself well outside of his grid slot and earning a five-second penalty later in the race. Best overtake: Alonso's pass on Sebastian Vettel through Copse on lap 34 was a sight to behold, holding firm when others would have backed out to pass the world champion. An epic battle followed. Best lap: The "Hammer time laps" put in by Hamilton before Rosberg's stop - where he cut 2.7s off Rosberg - ramped up the pressure on his team-mate. Worst lap: The opening lap was a disastrous one for Kimi Raikkonen, getting wide after The Loop and then bouncing across the track in a rather frightening crash which brought out the red flag and also eliminated Felipe Massa. Drive of the day Hamilton was a dejected man after qualifying but responded in fine style, giving his championship hopes an almighty boost with an absolutely vital win. Rosberg was leading for the first half of the race but on lap 29 came to a halt with a gearbox problem, handing the lead to Hamilton, who had been closing in the laps leading up to the problem. Valtteri Bottas managed to finish second in the Williams after starting 14th on the grid, while Daniel Ricciardo just held off Jenson Button for the final podium position. The race was halted for nearly an hour after a huge accident on the first lap involving Kimi Raikkonen and his team-mate Felipe Massa. Raikkonen ran wide coming out of Aintree corner and as he rejoined on the Wellington Straight, the rear of his Ferrari stepped out and spat him into the barriers, recording 47G on impact. He came back across the track and collected Massa, who did well to avoid T-boning the Ferrari at high speed. Raikkonen escaped without any broken bones but was assessed at the medical centre complaining of pain in his ankle and hip. Sebastian Vettel took fifth after an epic ten-lap battle with Fernando Alonso that culminated with a high-speed passing move at Copse. Kevin Magnussen finished seventh in the second McLaren ahead of Nico Hulkenberg and the two Toro Rossos of Daniil Kvyat and Jean-Eric Vergne. Rosberg made a clean start from pole position as Vettel bogged down in second, allowing Button to take position behind the lead Mercedes. 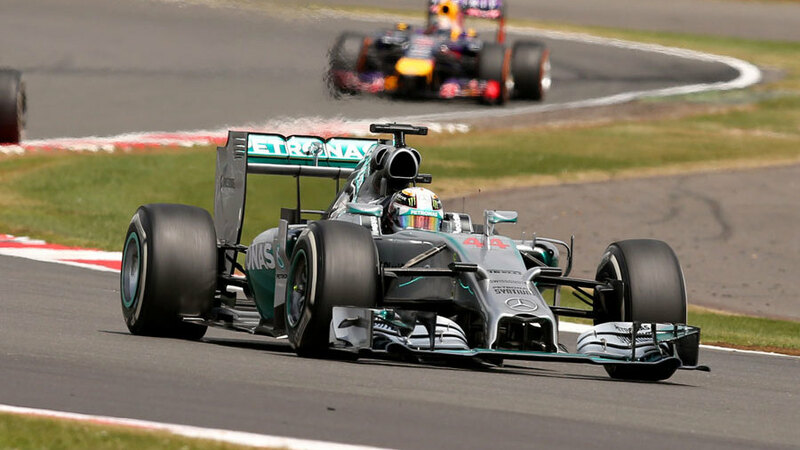 Hamilton immediately looked quick and was up to fourth despite contact with Vettel on the exit of Village. However, the charge was soon halted when Raikkonen's accident happened behind him and the race was red flagged. Damage to the barrier resulted in a lengthly stoppage and a chance for teams to assess their own battle scars and rejig strategy ahead of the restart behind the safety car. By lap five Hamilton was up to second place behind Rosberg and took a few laps to find his rhythm before hauling in his team-mate. Bottas was also making quick progress and past Button for third by lap 17. However, the Mercedes were in a league of their own and two seconds faster than the rest of the field. Hamilton was pushing hardest of all and ahead of Rosberg's pit stop on lap 18 was gaining by 0.5s a lap and had the gap down to 2.4s. A few laps later Rosberg started complaining of gearbox issues. However, Hamilton wasn't willing to rely on issues for Rosberg and adopted a different strategy, staying out on track on aging mediums while Rosberg exploited the extra pace of his fresh rubber. He eventually pitted on lap 24 and opted for hard tyres as opposed to the mediums bolted to Rosberg's car. Once again he started to haul his team-mate in, but when the difference in gap times was starting to be measured in seconds rather than tenths, it became clear that Rosberg's issue could be terminal. His gearbox finally gave up coming out of The Loop on lap 29 and Hamilton cruised past to take the lead, with a comfortable buffer built up over Bottas in second. From that point onwards it was easy running, but Hamilton made a second stop for fresh tyres just to eliminate any risk in the run to the flag. Behind him Ricciardo found himself up in third place on a one-stop strategy having changed to hard tyres before the restart. He was suffering with degradation towards the end, but the strategy appeared to be beautifully measured and he finished 0.8s clear of Button, who was also on a one-stop but using hard tyres in the final stint which offered more grip towards the end of the race. But it was the battle for fifth that attracted the most attention as Vettel was passed by Alonso after his second pit stop and then spent the next 14 laps battling back. The racing intensified from lap 37 to 47, with the two coming within inches at several occasions between Brooklands and Luffield. Vettel eventually made the move stick after attacking Alonso on the outside of Brooklands, muscling along the inside of the Ferrari in Luffield and then keeping his cool on the inside of Woodcote and Copse. He ran slightly wide on the exit, but after the no-holds barred battle it will not have crossed his mind to hand the position back to his rival. Hamilton is now four points shy of Rosberg in the drivers' standings, effectively resetting the championship for the second half of the season.